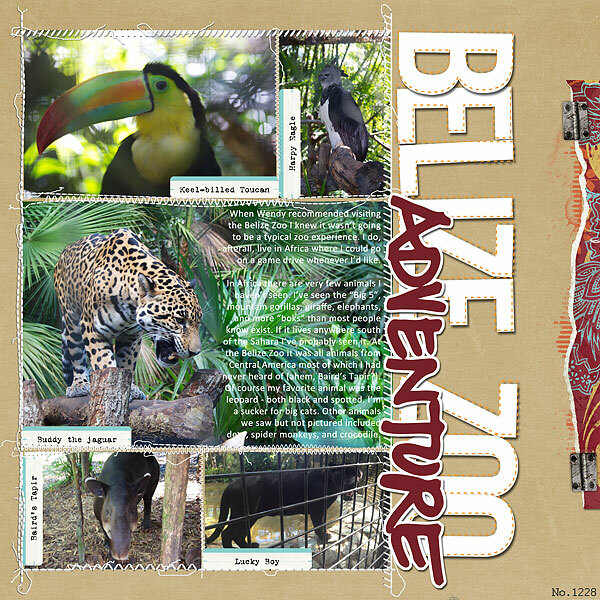 For a long time in my design process all I had was “Belize Zoo” because … that’s where the pictures were taken. Hello Captain Obvious. One of the last things I did before finishing my page was to look through my brushes for something to spiff up the layout. That’s when I found the “adventure” brush by Ali Edwards. 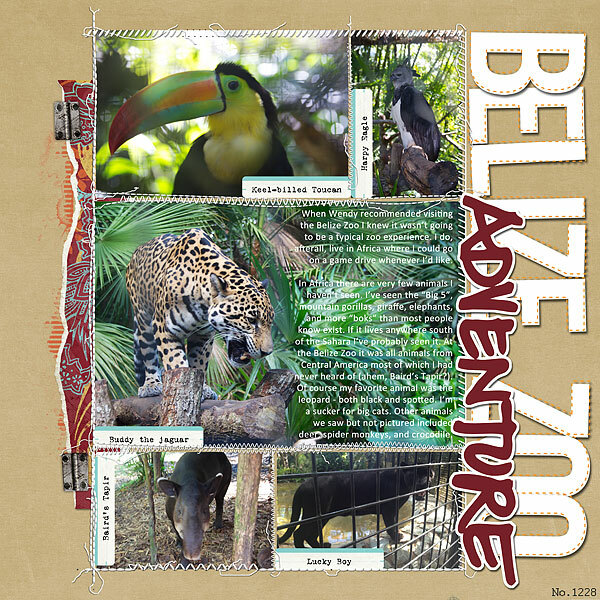 To that point I had “Belize Zoo” a bit smaller so that the journaling could be in a small block below it. When I found the brush that’s when I decided to go big with the title, add “adventure” on top of it as a sticker and then move my journaling to right side of the picture. Before adding “adventure” I figured I had a nice layout, but not something that fit the assignment. The new design, I thought, really elevated the use of typography AND it gave me more room for journaling so that I could tell more of the story than just the facts. Typography wise I chose the alpha for “Belize Zoo” because it was a nice bold alpha that was pretty large but had a bit of additional interest with the dotted lines. Also, sanserif fonts are better for titles. The hand written “adventure” worked because it contrasted with the sanserif of the other font in the title. I used a type writer font (VT Portable Remington) on the labels because I thought in real life I would use a typewriter on labels like those and then I used a really plain font (Calibri) for my journaling because it was already somewhat difficult to read against the plants of the photo. 1) That even though I had used a really plain font for the journaling it was still a bit tough to read. One of the instructors suggested blurring the background photo, which I did in the final product. 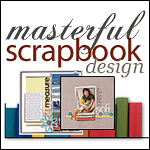 The blurring is subtle but it makes a bit difference in the readability of the journaling. I just used my blur tool in PSE and went line-by-line to blend the background. 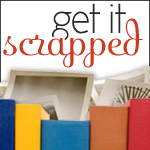 It’s not something I’ve thought to do before but SUPER easy to do in digi scrapping. I will definitely do it again. Much better, right? Another minor change that I made was to make sure that I was using all shadowed stitches. One commenter (another digi scrapper) noticed that some of the stitching jumped off the page and others did not. I realized that I don’t always pay attention to whether I’m consistently using either shadowed or unshadowed stitching, but now I will! I am so enjoying this class. Applying the topics are challenging and it really has me thinking hard about how to take my layouts to the next level. Next week … tension!